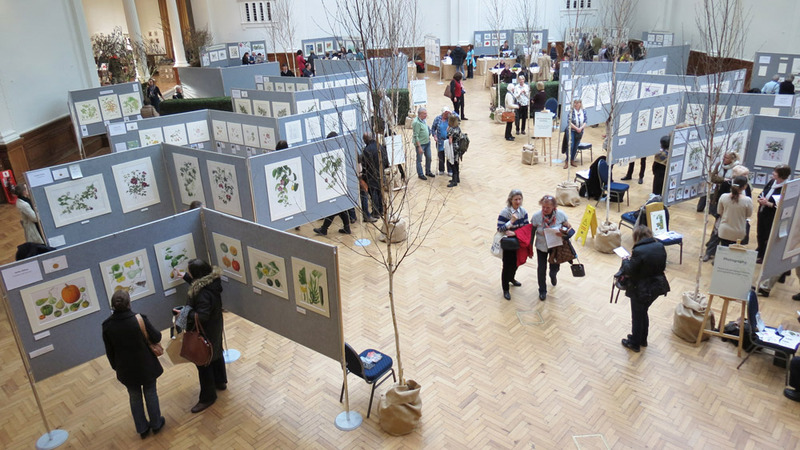 The RHS Botanical Art Show is the TOP juried botanical art show in the UK - and the world! from Europe, Asia, Australasia and Africa. ​​The RHS Exhibitions include both Botanical Illustration and Art and ​Botanical Photography. 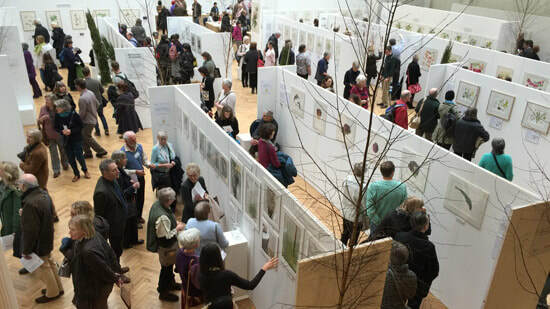 To be eligible to apply for space to display work at an RHS Show in 2020, you (an individual or a group) must first submit a sample of four pieces of work to the RHS Picture Panel for assessment and approval to exhibit. ​Approval lasts five years. ​This assessment takes place at the annual Submission Selection Meeting of the Picture Panel. Previously the main Botanical Art Show was usually held between February and April and the Malvern show in May. This changed in 2018. The NEW Botanical Art and Botanical Photography Show now takes place in July. A smaller show is also held at RHS Malvern Spring Festival Show in May - and the judging and medals are just the same. 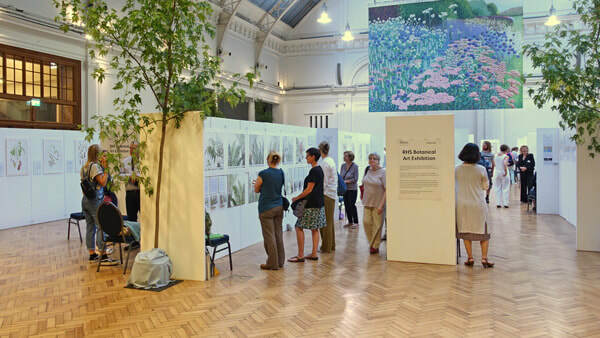 ​The banner picture at the top is of the RHS Botanical Art Show in London in July 2018. 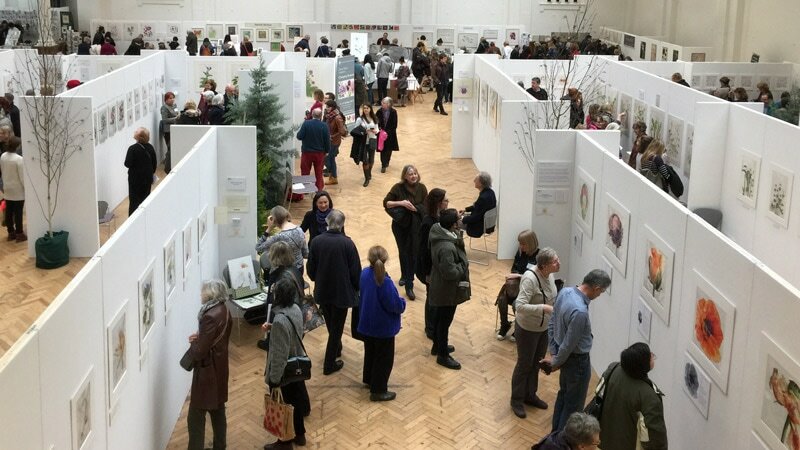 RHS Shows: Regulations and Guidance - This tells you "How to be approved to exhibit" and "How to Exhibit"
several articles about TIPS FROM RHS Gold Medal-winning artists about how to be successful at an RHS Botanical Art Show. Every year they come up with new tips! In 2019, the botanical art show will again be held with botanical photography in July in the RHS Lindley Hall. ​This is typically the larger exhibition that virtually all international exhibitors attend. You must be approved to exhibit before you can apply for a place - see the section on Assessment and Approval to exhibit below. ​See RHS Photography Exhibition for details of how to submit botanical photography. BEFORE sending any artwork, please contact the Picture Panel Secretary. It's recommended that you hand deliver artworks. The are special arrangements for overseas applicants. For more on how to exhibit see below. the Botanical Illustration Exhibitor Factsheet (557kB pdf) which sets out all the rules and regulations and "how tos"
Botanical Illustration is a genre of art that endeavours to faithfully depict and represent the form, colour and detail of a plant, identifiable to species level. As a technical discipline, botanical illustration emphasizes the depiction of accurate information, documenting the anatomical and functional aspect of a plant throughout its life cycle. The best botanical illustration successfully combines scientific accuracy with visual appeal. It must portray a plant with the precision and level of detail for it to be recognised and distinguished from another species. 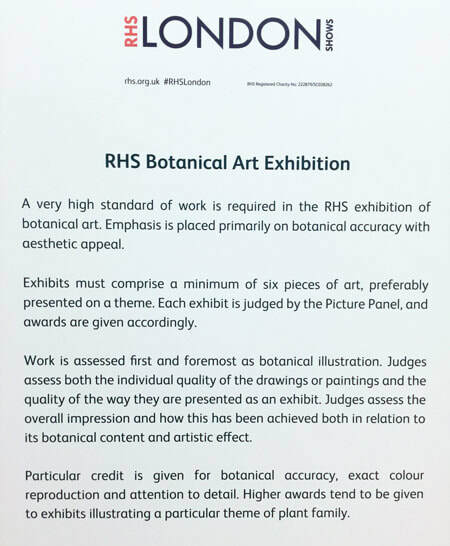 A very high standard of work (equivalent at least to a Silver RHS medal) is required to be selected to display botanical illustration at a RHS show. To be able to exhibit you must first be APPROVED TO EXHIBIT by the RHS Picture Committee. In other words your botanical artwork must be formally assessed to see if it meets the standard for exhibition. ​Getting approval to submit involves submitting work to the Picture Committee by the deadline for submission. The deadline for submission is not always obvious or announced but is generally around about September. Once you are approved to exhibit you then have five years to apply for space at a specific exhibition - otherwise you have to be assessed and approved again. This is because the Picture Committee recognises that many people's projects often take two to three years to complete. how to get approved to exhibit. Quotations are from the ​Botanical Illustration Exhibitor Factsheet (557kB pdf) unless otherwise indicated. Emphasis is placed primarily on botanical accuracy in combination with aesthetic appeal. Artists should present examples of their work that is of the highest quality and has been completed in recent years. Four original examples of botanical illustration, mounted but not framed, should be sent to the Picture Panel Secretary before the selection meeting. Artists from overseas should send actual-size unmounted prints of their work. Rolled in a poster tube. Prints cannot be returned. RECOMMENDED: Contact the relevant personnel listed in the Factsheet with any detailed queries - emails and telephone numbers are included. ​​The email address for both submission and show enquiries are detailed on the RHS webpage. You are already too late to get approved to exhibit in 2019 - because the Picture Panel selection meeting was held last year. The NEXT Picture Committee Selection Meeting - to consider submissions is on Thursday 9 May 2019. Successful applicants MAY then be able to exhibit at the 2020 exhibition. It depends on the competition for space from previously approved artists and those approved in 2019. 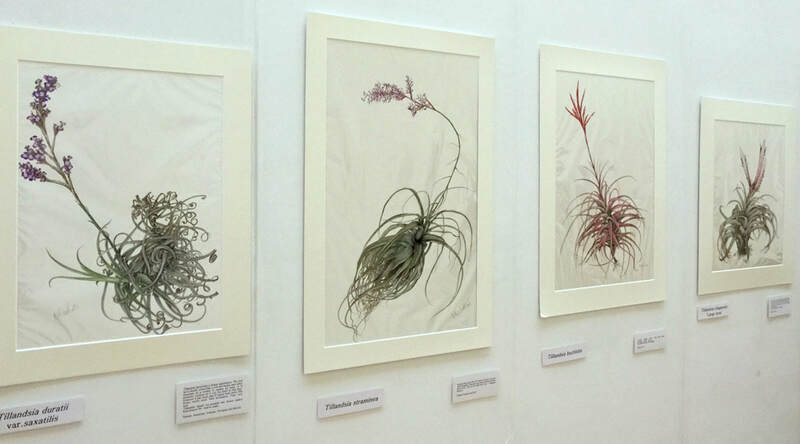 Below are images of the"Best Exhibits" at the last four RHS Botanical Art Shows. they are ALL by Japanese Artists. BEFORE you start to paint, determine the size you will work only after you have considered how you are going to transport your work (and protect during transportation) and then display it in the exhibition. Multiple Gold Medal Winner Julia Trickey has always planned her large paintings and had her entire exhibit planned to scale on paper BEFORE she began her paintings. You MUST exhibit and stage work as defined in the guidelines - including signage for the exhibit. Only artists who have been accepted by the Picture Panel are eligible to apply for space. you use the online application form which is ONLY emailed to those approved to exhibit by the RHS Shows Department. somebody must man your stand for the entirety of the exhibition - although you can ask somebody to do this on your behalf. Gold medals are only awarded to displays of outstanding and consistent excellence. It's not unknown for no award to be made. Whether or not you get the plant name correct - and write the Latin correctly - actually matters a lot! The aim is to achieve the right combination of skills. Along with other members of the judging panel, Gillian is supported by Deborah Lambkin (the RHS Orchid Artist) and Helen Allen, both of whom are also practicing artists and teachers. ​The work of the Judgement Panel is also moderated by a very experienced individual who moderates other RHS decisions about the award of Medals e.g, for gardens and plants to ensure consistency with standards. set out in more detail in an extract from Guidelines for judging group exhibits of drawings and paintings of plants, flowers and gardens (extract from Manual for Judges 2004, p13, No7) - however the assessment process is currently being developed and moderated. Katherine Tyrrell interviews Denise Ramsay after winning an RHS Gold Medal for her botanical art exhibit of "A Brilliant Life - Papaver Orientale" at the RHS Show in the Lindley Hall, London on 22nd October 2014. My dedicated TIPS page Tips from RHS Gold Medal Winners also provides a wealth of useful information - including tips from artists like Annie Hughes, Işık Güner, Julia Trickey, and Esmee Winkel - who have won multiple Gold Medals. Like any other open exhibition or art competition, visiting the show to take a look at the standard of the work and how work is presented pays dividends for those who do their homework. Warning - standards seem to rise every year. If you haven't seen a show for some time and are able to get to see one, I suggest you come and take a look. You might be surprised at how different it is. Anne Marie Evans visited the show in 2018 after a break of some years and commented that she was amazed at how the different the show is now compared to those she visited in the past..